The good news is that Kam Chancellor is reportedly coming back and the schedule is about to get softer. But there are still major issues for 0-2 Seattle, namely a porous offensive line that is limiting the franchise quarterback and a certain prized offseason addition. The Seahawks aren’t worried, but should they be? GREEN BAY, Wis. — The trouble with accepting the adoration that comes with success is that you’re also held accountable when there are failures. And yet Seahawks flag-bearers Michael Bennett, Earl Thomas and Richard Sherman are handling that duty with aplomb. And now they won’t have to deal with that energy. Chancellor reportedly ended his holdout on Wednesday. His return to the lineup will go a long way towards shoring up a defense that during his two-week absence has given up 713 yards and failed to produce an interception. With a smooth reintegration into the locker room, images of Packers backup James Starks tearing up the hashmarks through Chancellor’s would-be wheelhouse should soon be forgotten. That was the overwhelming sentiment among players, that Seattle’s problems were not a lack of talent, but a lack of chemistry with some new and emerging players that could be corrected quickly. Strong safety DeShawn Shead replaced Dion Bailey, the starter in the Week 1 loss at St. Louis, as Chancellor’s stand-in. Offensively, tight end Jimmy Graham was playing his second game with the Seahawks, Justin Britt was starting his second game since switching to guard, and center Drew Nowak was starting his second game, period. It’s true. Seattle has been down before. They started 3-3 last season and still reached the Super Bowl. But in the previous five seasons under Pete Carroll, the Seahawks started 0-2 just one other time: 2011, ultimately a 7-9 campaign and the only time they’ve missed the playoffs during Carroll’s tenure. And since the 1990 playoff expansion, only 11.7% of teams that started 0-2 have made the postseason. Yet none of those 0-2 teams had been to the previous two Super Bowls, and very few had one of the highest-paid quarterbacks in football, much less a defense including All-Pro talents like Wagner, Sherman, Thomas and Chancellor. The Seahawks aren’t worried. But maybe they should be. Take the team’s biggest offseason acquisition, Jimmy Graham. When he was with the Saints, Graham once fought to be subject to the wide receiver franchise tag rather than the lower tight end number. After all, he argued, in 2013 he had put his hand in the dirt on only 33% of his snaps—and he reeled in 1,215 yards and 16 touchdowns that year. Fast forward to Sunday night. Graham lined up from a traditional, hand-in-the-dirt tight end position on 28 snaps. He lined up in the slot, his comfort zone, only 12 times. On one critical third-and-10 play in the third quarter, Graham found himself blocking an outside linebacker while the tackle and guard double-teamed an interior pass rusher. Wilson overthrew Doug Baldwin on the play. After the game Graham ducked out of the locker room and brushed off a reporter mining for info—and vocal frustration—from him and his 45 visibly frustrated teammates. But in another room, Carroll lamented Graham’s disappearance (one catch, 11 yards) as a collective failure of the offense, and especially disappointing after his six catches in Week 1. The root of the problem is not Graham, or Russell Wilson, who targeted Graham just twice, or even (as Marshawn Lynch’s mom might have you believe) offensive coordinator Darrell Bevell. To see what’s going wrong, look no further than the second play of Seattle’s first offensive possession. The Seahawks aligned in an I-formation. Lynch, behind fullback Derrick Coleman, looked at a promising defensive front for a lead run off the left guard. The Packers presented two down linemen: Mike Daniels over the outside shoulder of right guard J.R. Sweezy, and B.J. Raji on the left shoulder of Nowak, staring down the new starting center. Across from the rest of the Seahawks’ left side, OLB Mike Neal lined up wide, and safety Ha Ha Clinton-Dix came down to the box alongside ILB Clay Matthews. 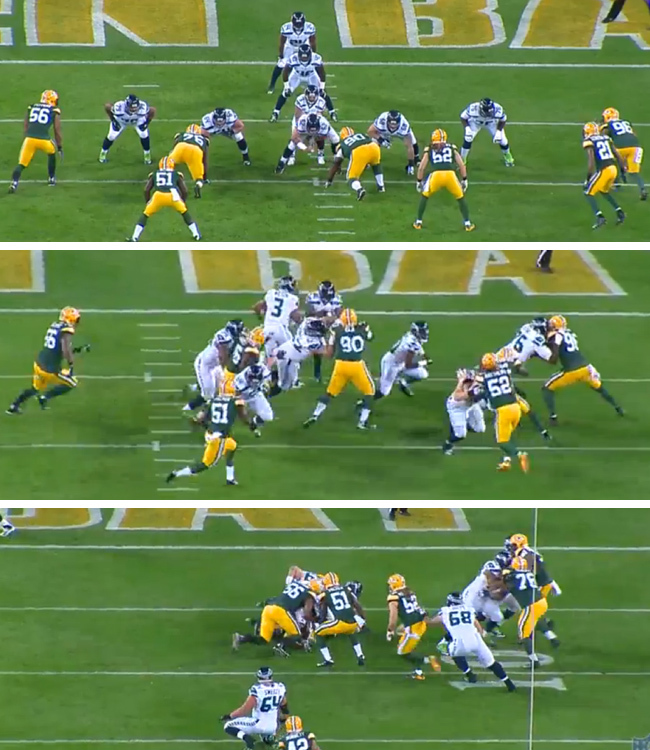 The call worked splendidly for Seattle, with one exception: Raji blew up Nowak. Lynch was swallowed up for a two-yard loss. Poor interior line play negates what the quarterback can do from the pocket, which creates the necessity for play-action passing and read-option running, which puts the quarterback on the move and reins in seam-busting tight ends, relegating them to roles like Graham served on Sunday: chipping Julius Peppers and leaking into the flat as a last-resort receiving option. New Orleans knows these things. In exchange for Graham and a fourth-round pick, they netted a first-round selection as well as Seattle’s best offensive lineman: Pro Bowl center Max Unger. The price may not have seemed particularly steep for the Seahawks, especially since they were reportedly going to part ways with Unger anyway. But, two games into the season at least, the issue seems to be the insistence on plugging Nowak, a former defensive tackle and Jaguars castoff who spent last season on Seattle’s practice squad, into that spot rather than using the draft or free agency to find a new pivot, or indeed to address any of the needs on the O-line. Meanwhile, Raji experienced a career revival in one evening. The nosetackle, who missed the 2014 season with a torn biceps, made two tackles for loss and was easily the biggest reason Lynch gained just 41 yards on 15 carries. The rest of the Seahawks offensive line didn’t fare much better in the run-blocking arena, with the Packers collecting seven tackles for loss in all. • THE PULSE OF PHILLY: Jenny Vrentas on how the Eagles are coping with their disastrous 0-2 start. Players are grasping for answers as they try to figure out what has gone wrong and how they can move forward. The Seahawks have locked up a dozen stud contributors to long-term deals over the past three years but none of them on the offensive line. According to spotrac.com, the team is dedicating $12.7 million, or 8.58% of its 2015 cap, to the offensive line, less than all but three other teams. The bulk of that is Russell Okung’s $7.2 million cap hit in the final year of what now looks like an exorbitant rookie contract. Okung was Schneider’s first draft pick, in 2010, the last year before the rookie wage scale went in. Since then, Schneider’s draft classes have included 10 offensive linemen in five drafts; in the last four years Seattle has taken only one in the first three rounds (Britt, a 2014 second-rounder). Meanwhile, right tackle Breno Giacomini, a three-year starter, signed with the Jets after the 2013 season. Unger, a two-time Pro Bowler during his six seasons in Seattle, is now in New Orleans. James Carpenter, the only other offensive lineman Schneider ever drafted in the first round (25th overall in 2011), joined Giacomini in New York after a disappointing four years in Seattle. John Moffitt, a third-round pick in ’11, lasted only two seasons before spending a year in Denver then opting for early retirement. So offensive line coach Tom Cable is left to try to work miracles with players like Nowak; right guard Sweezy, another converted defensive tackle taken in the seventh round of the ’12 draft; and first-year starting right tackle Garry Gilliam, a 2014 undrafted free agent out of Penn State whose claim to fame is catching a fake-field-goal TD in last year’s NFC title game. Is there a remedy in sight? Nowak won a training camp battle with Lemuel Jeanpierre, who was released at the end of August. Nowak’s current backup, Patrick Lewis, has some experience (four starts in spot duty when Unger was injured a year ago). But, unlike Bailey in the secondary, Nowak was not benched despite a poor performance in St. Louis to open the season. That suggests that Carroll and Cable feel he’s the best option they’ve got. Veteran Alvin Bailey filled in when injuries struck the last two seasons but is unlikely to provide any kind of upgrade. Seattle spent two fourth-round picks on offensive lineman in May; Mark Glowinski could be ready later in the season, and Terry Poole is on the practice squad. And who knows? Nowak could develop into a quality starter with more reps in the offense. But for now the offensive line’s failures are hampering the effectiveness of the franchise quarterback, the all-world running back, and the tight end who was Schneider’s biggest and boldest offseason acquisition as a GM. There is plenty of time to turn it around, but as they walked off Lambeau Field on Sunday night one thing seemed clear: The Seahawks weren’t prepared for this.